Every year in the month of June our small east Texas town comes to life and gathers together to celebrate the Tomato by hosting Tomato Fest. 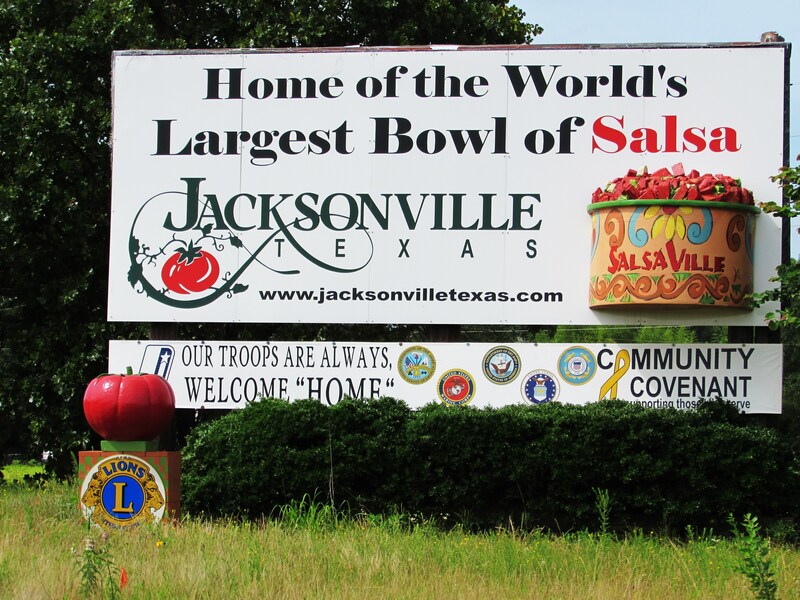 Jacksonville is considered by all who live here to be the tomato capital of the world. And while that may be debatable there is no doubt whatsoever we are the home of the World Record Largest Bowl of Salsa. I know because I was there, in charge of the kitchen, for close to 14 hours. That’s how long it takes to chop that many ‘maters and clean up the juice. We made over two thousand pounds of salsa that day. We were even on national TV. See, I even have a picture to prove it! Today I want to honor the Tomato. I do this by sharing one of Jacksonville’s most charming features, the painted tomatoes that are scattered around our town. I’m not sure who had the idea first but it caught on quickly and now these darlings can be spotted from the beauty shop to the vet’s office to the hardware store and even down at the bank. I present to you, Jacksonville Tomatoes! Dairy Queen on Jackson Street. Yes, we have TWO DQ’s here! It is all covered up! Love this one, Texas Basket Factory. This is a personal tomato so I trespassed in someones yard for this picture. Sorry! Tomato at the Tomato Bowl, football anyone? Addie’s Favorite because it is purple. A quick side note-if you are from Jacksonville and I missed your tomato I am really sorry! Total accident on my part. I kinda just got this wild hair and started driving around town with my child in the back seat as a spotter and when we saw a tomato we stopped. We got out. We took a picture. Total randomness. Well, not total. We started on the west side of town and made circles inward until I ended up downtown and then I got out and walked. But you get my point. And you also now know that I am not a creeper. Just a sad chicken blogger with a new camera. I love Bill Day’s tomato! Love your pictures! I didn’t even know about some of these… Great job! So many tomatoes! Great pictures! My favorite is the smiley face one. I would never have gotten to see all these if not for your photos…good job!